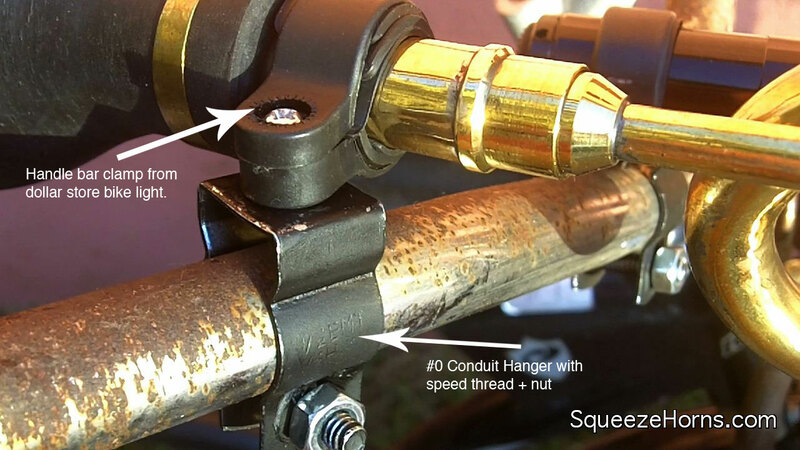 Attaching your squeeze horn to your bike can be problematic. The attaching brackets I include in your order work well for the 7″ and CAN be used to mount the larger horns, but honestly, the design isn’t right for all horns. The problem is that the horn part of the attaching bracket is designed to go around your horn’s smaller tube, and that joint is probably the weakest link in the horn’s construction. I am working with the manufacturers to design a more elegant bracket, but in the meantime I’ll be posting some of my own experiments. The setup I have pictured here, while not the nicest to look at, has proven to be very sturdy. It’s a plastic bicycle handle bar clamp from a Dollar store bike light wrapped around the main squeeze horn tube. And a #0 Conduit Hanger (with speed thread, meaning you don’t even need the extra nut shown) from Home Depot, which I painted black. On another bike I’m using a butterfly nut to attach the clamp to the conduit hanger, which makes it easier to remove as well. Probably some of you are much handier in the garage than I am. So I look forward to hearing and seeing how you attach your horn to your bike, car, boat or what have you. ← Squeeze Horns on the Playa!